Whether you're waiting on a new kitten or you're ready to find homes for a litter of kittens, be patient. A kitten develops key social skills during the first three months of her life, having a significant impact on the kind of cat she'll become. 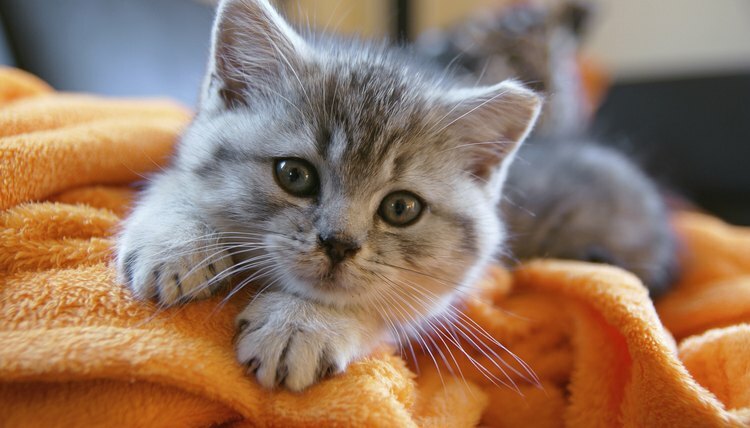 Ideally, a kitten should be with her mother and siblings until about 12 weeks of age. Kittens develop quickly, so it's easy to think that because they're eating, drinking and using the litter box on their own, it must be time for them to leave the nest. But that's not so. Weaning, the process of transitioning from mother's milk to cat food, doesn't happen overnight. Instead, it's an evolution that takes from four to six weeks, as a kitten gradually begins to rely on herself for her own care. Weaning involves more than food; it's about how a kitten develops her own independence. Though she's mostly self-sufficient by 7 weeks old, a kitten relies on her mother for guidance as she explores her world. During this time she learns how to interact with other cats, people and her environment, and if she's removed from the safety of her mother and litter mates too early, she may develop into a skittish, insecure cat. That can translate into poor behavior, such as biting, scratching and bad litter box habits. As well, a kitten often receives her first shots, and boosters, between 6 and 12 weeks of age; periodic nursing from her mother is helpful to her immune system during that time. RSPCA: How Old Should a Kitten Be Before They Are Adopted/Purchased? Fanciers Breed Referral List: How Young is Too Young?